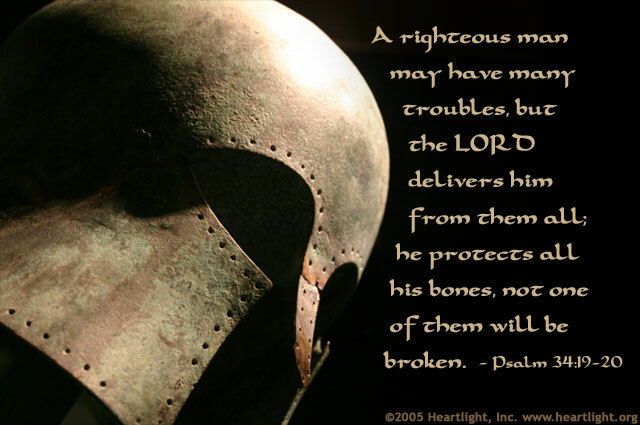 We know that the righteous can have troubles, but how do we understand that God delivers us from them all? How do we understand that he protects all our bones, especially in light of recent tragedies and the persecution of believers in many places in the world? Paul demonstrates the answer: whatever happens to him will turn out for his deliverance — whether it is through his death to be with God or whether it is through his release from prison to continue ministry (Phil. 1:19-23). Our deliverance is secure. We are conquerors in Christ. Nothing Satan can do to us can steal us away from God's love, not even death (Romans 8:32-39). Father, please give me the faith I need to believe that whatever happens in my life will not steal me away from your love and deliverance for me. In Jesus' name I pray. Amen.